James Huctwith lives and works in downtown Toronto. Born in 1967, he was raised in rural Southern Ontario. He attended Cayuga Secondary School from 1981 until 1986, graduating with honours from Grade Thirteen. Afterwards, he studied fine art for three years at the University of Guelph, primarily interested in theory, history and architecture. After this, he lived in Vancouver in the early ‘90’s where he first began to paint and exhibit. Returning to Toronto in 1995, he began producing and exhibiting professionally with the O’Connor Gallery. He was with the gallery for a decade. The next three years were marked by personal upheaval and marked changes. In the spring of 2005, Huctwith joined Gallery Jones in Vancouver for two years, and produced a run of 'colder' non-figurative works, in contrast to the O’Connor shows which had been physically and emotionally explicit. Huctwith left O'Connor and joined Galerie Harwood near Montreal, also for two years, starting in 2006. The work produced for this gallery was marked primarily by considered re-interpretations of the still life genre. Feeling it was time to regroup and rediscover where he wanted to go with the work, Huctwith moved all his work back to Ontario, placing past work with Antonio Arch Fine Arts Ltd. in Toronto, and signing up with Galerie La Petite Mort in Ottawa. His first show there, in the fall of 2009, was a success. Both published and regularly reviewed, his work is collected both nationally and internationally. 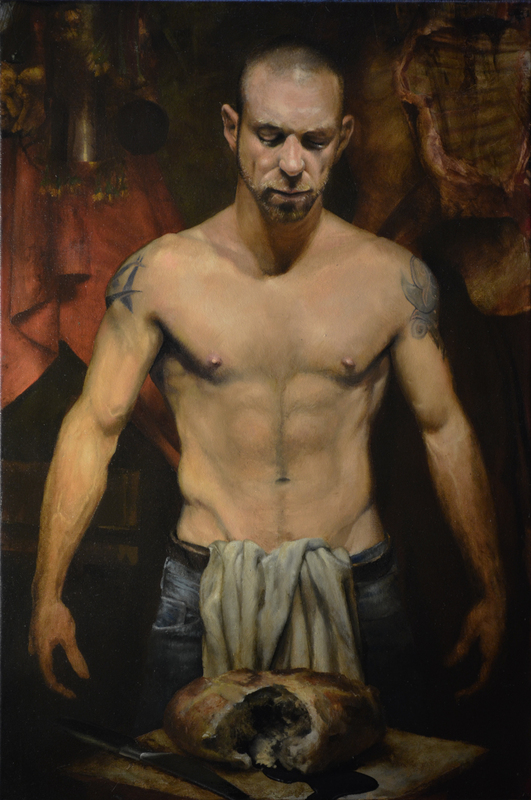 James is now represented by Pentimento Fine Art Gallery. To view work that is available please visit our website at www.pentimento.ca .